With thousands of fund choices available, building a diversified portfolio can be challenging. The Personalized Portfolio Builder tool simplifies the selection process to help you create a diversified portfolio of mutual funds or ETFs that meets your needs. 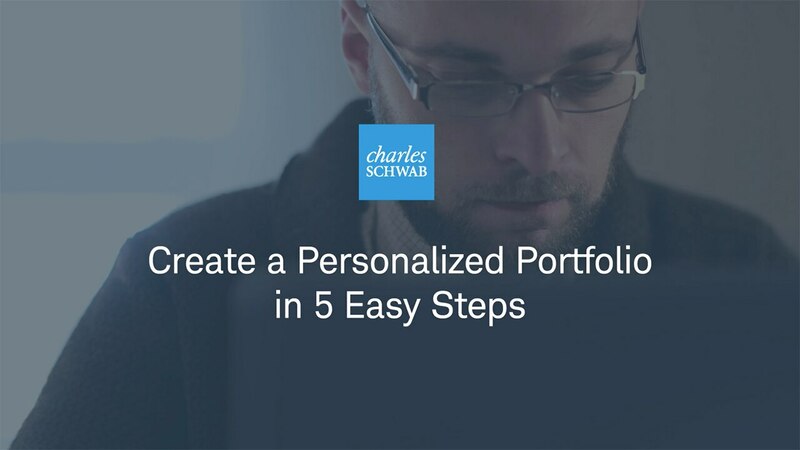 How does the Personalized Portfolio Builder work? The tool is designed to help you to diversify your portfolio using Schwab's asset allocation models, which range from conservative to aggressive. These models were designed to help you to determine an appropriate allocation of assets across various types of investments, based on your financial goals, risk tolerance and time horizon. You will be guided through steps to help determine your fund preference, risk profile, and initial investment. The tool will show you ETFs or mutual funds that you can choose from to build a portfolio that matches your preferences. In using this tool, be aware that Schwab is not analyzing your investment portfolio, your individual circumstances, or considering or recommending what you should buy, hold, or sell in your account. But with thousands of funds to choose from across many asset classes, getting started can be challenging. Schwab's Personalized Portfolio Builder simplifies this process by helping you build a diversified portfolio of mutual funds or ETFs (exchange-traded funds) that meets your needs. First, log in and choose the specific Schwab account you want to build your portfolio in. Then you'll select the type of investment you're looking for. You can build an all-mutual fund portfolio—either taxable-bond funds or municipal-bond funds—or an all-ETF portfolio. From there you'll choose your risk profile, ranging from conservative to aggressive. Once you choose, you'll see a preview of our recommended asset allocation. After that, you'll specify your initial investment. There is no minimum, but we suggest at least $5,000 to ensure proper diversification. The charts provide information on recent performance history, or you can dive deeper for a more thorough comparison. Once you select a fund, the Personalized Portfolio Builder automatically calculates the number of shares you need to purchase in order to match your target asset allocation. You'll choose across multiple asset classes to build your new diversified portfolio. You can customize your allocation percentages to fit your preferences or opt out of an asset class altogether. Once you've completed your selections, click the Trade button to purchase the funds. You'll now be able to track and monitor your positions from your account. To access the Personalized Portfolio Builder and get started on your own diversified portfolio, open an account in just minutes on schwab.com or call us with any questions at 866-855-7728. 2. For illustrative purposes only. All tickers are hypothetical and do not represent any actual investment. Please see important disclosures at the end of this presentation. Open an Account or call 800-435-4000. Investment returns will fluctuate and are subject to market volatility, so that an investor's shares, when redeemed or sold, may be worth more or less than their original cost. Unlike mutual funds, shares of ETFs are not individually redeemable directly with the ETF. Shares are bought and sold at market price, which may be higher or lower than the net asset value (NAV). Diversification does not eliminate the risk of investment losses. State, local, and the Federal Alternative Minimum Tax may apply. Capital gains are not exempt from Federal taxation.